May 1st is National Loyalty Day. In honor of this holiday we would like to remind our contractors of our Contractor Rewards Program! This program rewards our loyal contractors by allowing them to redeem points for every HTP unit they purchase. Once points are accrued, contractors are able to choose from a variety of rewards items, including iPads, cameras, HTP gear, money and even certain HTP units! 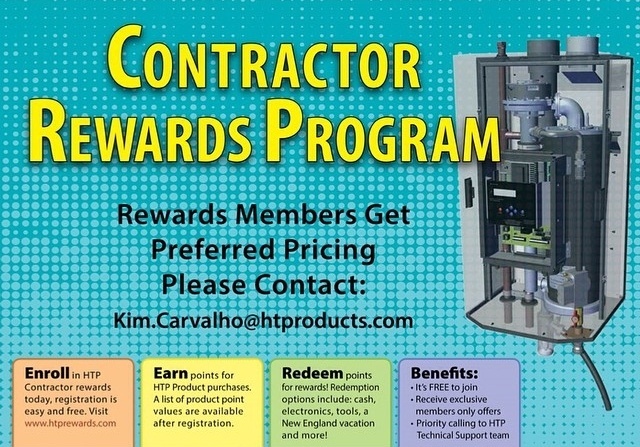 The HTP Contractor Rewards Program has around 800 members. Recently a contractor saved up enough points for a $6,000 check! The program is specifically set up for contracting companies. In order to become a member, one must sign up for the program as a company, with a company representative that will monitor the rewards and points. Members can enroll online for free at www.htprewards.com. To earn points, members must submit claims online. All claims materials must be submitted within ninety days of the purchase of the eligible HTP products. Once logged into the rewards site, points can easily be claimed by clicking Get Points and filling out a quick form.